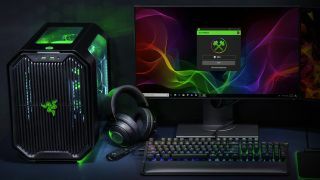 Razer has revamped its cyber currency and rewards system, introducing a new way of earning virtual credits – by using your GPU for crypto-mining. As you may recall, Razer launched its virtual currency in March 2017, but it has now rebranded zGold and zSilver as simply Razer Gold and Razer Silver. Although their function will stay the same, with Gold remaining the actual currency you can spend at stores (like GamersGate, for example, or Razer’s own store), and Silver being a system of loyalty points you can accrue to exchange for various rewards. The big news is that when it comes to earning Silver, it’s now possible to rack up credits using Razer SoftMiner, a Windows application (compatible with Windows 7, 8, and 10) which taps into the PC’s graphics card, using any idle downtime for a spot of blockchain mining. The longer you leave SoftMiner running, and the more powerful your GPU, the more Razer Silver you will accumulate. The minimum recommended graphics card is an Nvidia GeForce GTX 1050 or AMD Radeon RX 460. Bear in mind that this activity will slow your PC down to some extent, of course – and it will also use extra electricity. Also worth noting is that if you are one of the first 5,000 users to install and sign up for SoftMiner, you’ll get 1,000 bonus Razer Silver. The company also announced the return of its ‘Paid to Play’ scheme on Razer Cortex, whereby folks can earn Razer Silver simply by playing games. Cortex is also available on mobiles, so you could rack up credits while gaming on the move, as well as on your PC, to spend on goodies like Razer’s keyboards and mice.